Canadian artists Jamie Drouin and Lance Austin Olsen have been collaborating since 2000, exploring a mutual interest in sound as a modifier of perceptions, and diary-like record of temporal experiences. Their duo albums under the name DROUIN/OLSEN, and larger ensemble works, have established a distinct voice in the experimental improv scene, each release pushing their own approaches and processes into fresh, fertile ground. 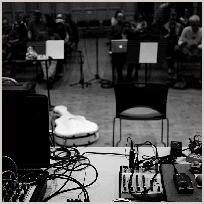 Their performances and recordings show strong evidence of a lengthly dialogue between two artists - Drouin using a simple analog synthesizer and radio, Olsen using a series of amplified found objects and cassette tapes. In their untitled work for Anonymous Zone, they once again reinvent their vocabulary, opting for a palette that partly imitates Japanese wooden flutes, or stringed instruments, but with a persistent serrated edge which purposefully resists having the composition rest simply as a beautiful object.